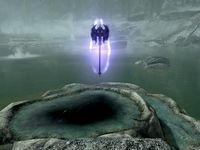 Shadowrend is a Creation that adds the eponymous Shadowrend weapon. It was released on April 5, 2018 for 300 CC Credits. The quest added by this Creation was made by unoctium. This Creation adds Shadowrend, a weapon which originally appeared in the Shivering Isles expansion for TES IV: Oblivion. There are two versions of the weapon, a greatsword and a battleaxe, but you can only possess one at a time. Upon installation, the quest Through a Glass, Darkly will begin and you will be directed to a geyser pool in Eastmarch where you must defeat a shadowy clone of yourself in order to claim Shadowrend. After completing the quest, you can return to the geyser at any time to switch between the two versions of the weapon. This page was last modified on 30 August 2018, at 20:49.